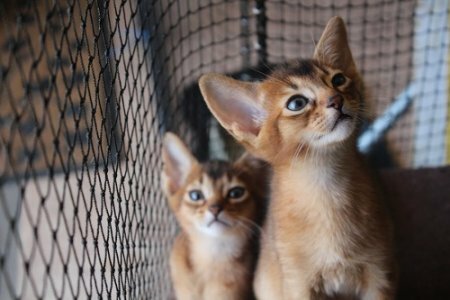 All our kittens are raised in the house, on lyno tile for hygienic reasons, in individual Caboodles with lots of natural light and fresh air. When required the area is fully air conditioned and heated for those cool Brisbane winter nights. Our Fur Family's health care is of paramount importance to us. Sue is a Senior Vet Nurse and is exceptionally particular about the health of our Fur Children. We have a fully qualified Feline Vet (Lee Dekkers) on call at all times. Whenever we are away we have a fully qualified Pet Sitter or live in attendant. Here at Osiris (V) we only do two kittening seasons a year Dec-Feb and June-August. Currently we have a number of girls with kittens that are still a few weeks off going to new homes. 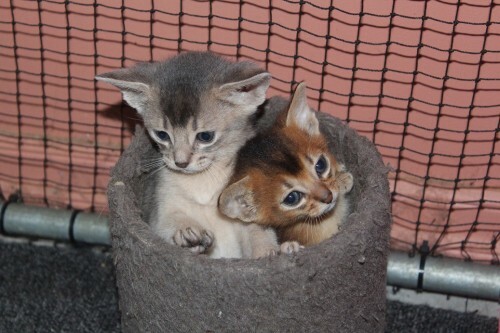 As is the case a lot of our kittens are pre-reserved and a few of them are headed far afield as Singapore, Jakarta, Hawaii, New Zealand, France, Sweden, Russia and various other foreign homes. The Dec-Feb kitten season will see some really stunning kittens available from our Wonder Cat Sammy Davis Junior, imported Highgaitpaws American Edition AKA Ed from New York (USA) and out very own up and coming Osiris (V) Crazy Love, Osiris (V) Heart's Perfection, Osiris (V) Ralph Lauren and Osiris (V) Touch of Love.. 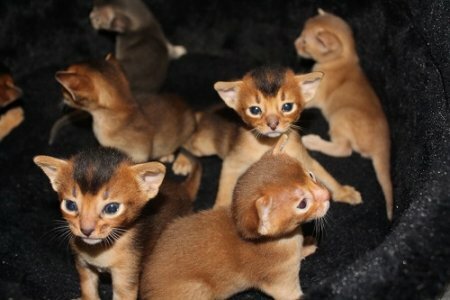 These boys are bound to produce some really stunning kittens with color and clarity not previously seen in Australia. We are really, really looking forward to this season's births as these boys are some of the very best Aby's we have ever produced. If you would like to home a stunningly beautiful, adventurous, loveable, super friendly Osiris (V) Aby contact us now!!!! 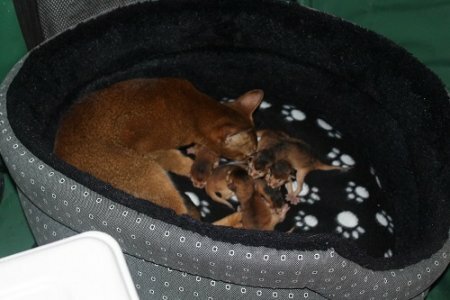 Just a few more photo's of the Osiris (V) Fur Children. These are kittens from Osiris (V) Special Witnes and Osiris (V) Sammy Davis Junior. Stunning little Fur Children at 3 weeks note the deeep black colour on their heads and back (flash has washed out some on the second pic) also the ears and ear set. They will be really stunning Fur Children to be assured. Wel done first time Mum Osiris (V) Special Witness !!! We take pride in breeding fabulous temperaments. In order to reserve a current kitten or one from a future litter we will require a $150 deposit. The deposit while non-refundable is transferable to another litter should circumstances require it to be.